Parrano cheese has been called 'the Dutch cheese that thinks it's Italian.' Call it whatever you'd like . . . it is delicious. I love to simply slice and enjoy. Parrano is great as an appetizer with soppressata or salami. There is technical information you can learn about this wonderful cheese, if you want to feel fancy at dinner parties. Parrano has a 'mild and nutty' flavor. 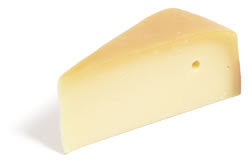 It is a cow's milk cheese that is made in the Netherlands, and while it is technically part of the Gouda family, it tastes stronger than a typical Gouda. It resembles a mild Parmesan. Parrano cheese is sold at any cheese shop or fine grocery store. Any other cheese favorites among you foodies?